Medha Patkar's makeover is a professional one. She has switched jobs. The brave grassroots activist -- who has devoted her life to protests for innumerable causes that affect or strengthen the poor, attracting national, as well as global attention -- has always doggedly fought for support. Today, Vaihayasi Pande Daniel discovers, she is fighting for a commodity far more tricky and slippery. Votes. "Yeh party nahin, yeh andolan hai. (This is not a political party. This is a movement). At 59, Medhatai is reinventing herself. No, it is not an external makeover. She still wears her simple handloom saris that could certainly use a little more ironing. Not very pretty footwear. Her neck, ears and wrists are bare of ornaments, except her reading glasses, hanging on a black string and a functional, black-strapped watch, its dial facing inwards. There is bindi on her forehead. Her silver hair is scraped back in an untidy braid that hangs limply down her back. She is hampered by no possessions except a basic Nokia phone, a notebook and less than Rs 10,000 in the bank. Today she is fighting for a commodity far more tricky and slippery. Votes. Patkar does not see it as a radical change of roles, although she says she feels awkward asking for votes and promoting her track record. "But people have the right to know about the candidate's work." She says she is appalled and saddened at the way the country's governance has radically deteriorated. At the manner in which India's resources are being frittered away, carelessly, by a few. She feels the character of the State is at its worst -- corrupt, criminal and callous. "Now communal forces through Narendra Modi are trying to take over. It is a great risk for the country's unity within diversity." She felt she had no alternative but to step in. "With mainstream politics becoming a big scam and scandal, someone has to see that the mainstream (ways) will not flood everything... And also drown all the pieces of land where we are standing," she says, using a metaphor that harks back to the struggle for her beloved Narmada river where she first sprung into the national consciousness. Image: Medha Patkar campaigns in Mumbai's North East suburb of Vikhroli. "India is not shining. Not gleaming. Because of jobless growth. A handful of economic players are in control... It is certainly worrisome. This, in spite of India being a beautiful and bountiful country with resources." Her mother's home in Chembur, northeast Mumbai -- where everyone in the area seems to know her -- has become her new political headquarters. On the door is pasted a sticker: Prem se kaho hum insaan hai (Say it with love that we are human). The small apartment, furnished with only the basics, apart from awards and photographs -- Mahatma Gandhi, a wistful black and white picture of Medha Patkar in the Narmada Valley and more -- overflows with files, papers, shelves and shelves of law and development books (Citizens' Fifth Report, Indian Constitution Law, Inter-State and International Water Disputes) and buzzes with activity. Young volunteers bustle in and out. Her Aai has been trying to reach her, repeatedly, to check when she will have dinner, at least (lunch was skipped). The media, television cameras in tow, visit too. As does anyone who wants to stop by for a chota chat with Tai, even smack in the middle of a media interview -- the liftman, a worker, or anyone who have been a beneficiary of Patkar's concern. She remembers each of their situations, apart from their names. Hot cups of chai, coffee, biscuits, snacks are in perpetual supply -- there are jokes gleefully floating about how important it is to be a chaiwallah these days. "Sahi chaiwallah apna basti ka hota hai (the real tea vendor is in our area)," Medhatai says. Her team is figuring out strategy, banners, handbills, meetings, transport, donations, permissions, drawing up lists of election agents; some of them have come down from other Narmada Bachao Andolan offices. The pamphlets being produced are a team effort, but Patkar has written the Marathi one herself. Maps of the constituency are up on the wall -- nearly 40 percent has been covered once already. Her nomination will be filed on April 3, for which the only assets that she has to show are some investments made in post office schemes, years ago, by her family for her, which she says she has to calculate; she owns no property and has no loans. Patkar is not tech savvy she confesses and various volunteers handle the social media and e-mail aspect of her campaign, meant to reach the middle and upper class. The earnest electoral efforts afoot at the apartment on 11th road, Chembur, are a cottage industry. It does not, in the least, resemble the smooth ops rooms of more seasoned politicians. The other difference: Patkar is an unflagging, very human campaigner. Her pace is frenetic. She sleeps barely three to four hours. She covers huge distances, walking her constituency, in a door to door campaign, over five to seven hours every day. The mechanics of projecting Medha Patkar's causes is quite different from projecting Medha Patkar. 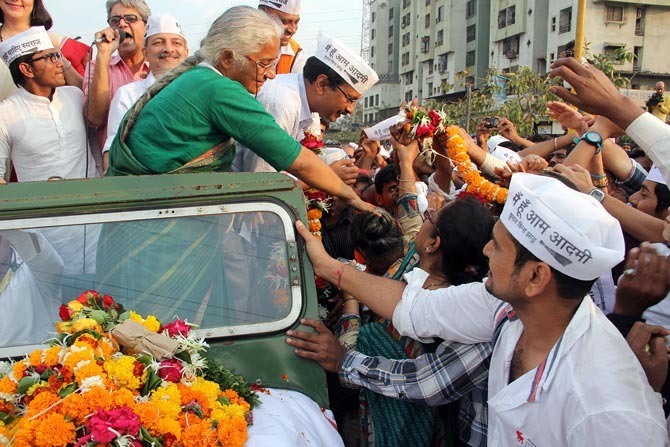 Image: Medha Patkar campaigns in Vikhroli. She professes being ill at ease with having to create props that promote her. Nor is she comfortable using cars for electioneering because she says she always uses public transport. Medha Patkar runs her life on such principles that prevent her from dining in restaurants or taking vacations; her religion is relentless work although she says believes in the power of nature and people. "Putting my face on posters. This we have never done. As a principle in the movement no one would give a slogan with my name. Mera naam se naara dene kabhi manjoor kiya mein ne? Abhee woh nara sunne mein ko bahut kaisa kaisa hota hai (Did I give them permission to use my name in slogans? It feels awkward when I hear such slogans). That's the way politics is." Funding is tough. The strategy is to ask for a "note per vote". "Yes (finding funds is) very difficult. We have just collected around Rs 15,000 at Azad Maidan. On that we have to proceed. Funds, of course, will come from the party now. They have committed to that. They are quite transparent so we have no problem. We are taking in kind also." Some new rules, she explains, now govern the use of 'in kind' help which makes the process more difficult. Donations, from supporters and admirers, is the backbone of the campaign. Becoming a politician is a decision that Medhatai is fairly comfortable with. She is also realistic. "I am very clear that there will be no magical transformation overnight." "Parliament and the whole democratic paraphernalia exists in this country. We are all voting. We all are expecting so much. That's why we are voting. This paraphernalia somewhere gives an impression that there is representative democracy in this country... Actually whatever we want to achieve, even within the framework of the Constitution, (for that) we have to struggle and struggle for even basic survival of the people, basic needs fulfillment and basic democratic governance." "So there is a need now for some consistency between what is happening inside and what is happening outside Parliament. The extra-parliamentary politics of people's movements must be strengthened and taken forward. But inside (Parliament) also there should be a voice raised. Otherwise, they (politicians) give with this hand and take away with that." "So many Acts, they just pass within minutes. No one to question. And there is this unholy alliance among the present day mainstream parties." "No one is questioning the basics of our economic policies. No one is questioning the vulgar inequity which is leading to injustice. No one is questioning the absolutely unjustifiable corruption. No corruption is justifiable. But even more unjustifiable are the big scams." With many years of working indefatigably in activist movements, and knowing the way wily politicians work, or more importantly criminally prevaricate, she feels that unless activists like her do not attempt to take on these critical, nation-threatening issues, then no one else would. It has, in her view, reached a point of no return. 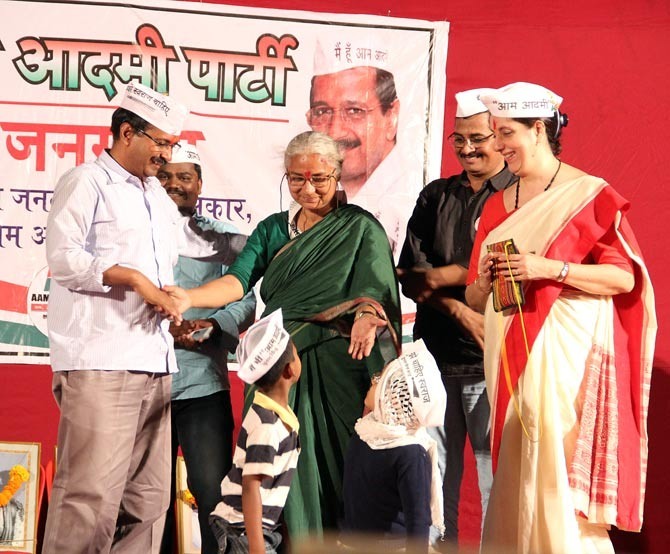 Image: Medha Patkar greets supporters along with AAP leader Arvind Kejriwal during the latter's recent visit to Mumbai. Medha Patkar knows contest a Lok Sabha election is very risky and entirely different from the challenges she has faced as an activist. She does not feel activism is thwarted by politics; both are necessary, she says. She enjoys the challenge of entering politics. Taking up steep challenges is something she is used to; that was how she began her work in the Narmada Bachao Andolan. "Without a challenge you cannot change paths or change systems," she says. "At the last nine biannual conventions of the National Alliance of People's Movements (she is the national convener) -- if you see our agenda -- every time, we had a full-fledged session on the role of the people's movement vis a vis electoral politics... Every time after due consideration of all factors, parameters, views and perspectives, we always came to the conclusion that we would like to remain in the movement politics." "Movements are also politics. Politics is about changing power relationships -- among, firstly, the various sections of the population and, secondly, between the power holders and the people at large. These two kinds of relationships can be changed through movements. And also through electoral politics to an extent." "We decided that we better be in non-electoral politics because there was no kind of space created for the movements to enter in and people also would not vote for us. The movements support would not get translated into votes." "But I had also started feeling, within hearts of my hearts, some kind of dilemma... Movements must continue, alliances get strengthened, at the same time there must be a dent made into the (political scene) because politicians are living just like raja ke bete, praja mar jaye ya jeeye (the son of kings are not worried if their subjects exist or die)." In her assessment, that changed with the arrival of Aam Aadmi Party leader Arvind Kejriwal on the scene and his convincing campaign to raise awareness about the staggering levels of corruption in the country and those responsible for it. "Yes he made that dent. Actually anti-corruption movements have always led to that kind of thing -- take JP's (Jayaprakash Narayan) time, (later prime minister) V P Singh's time. Corruption was the issue. Image: Medha Patkar at a rally in Kannamwar Nagar in suburban Vikhroli. Also seen are Arvind Kejriwal and, extreme right, Meera Sanyal, the AAP candidate from Mumbai South. Medha Patkar has chosen to contest the 2014 Lok Sabha elections from Mumbai. The Narmada Valley was not an option because those Lok Sabha seats are all reserved for scheduled castes. Her seat is the Lok Sabha constituency of Mumbai North East (the eastern suburbs of Mulund, Vikhroli, Bhandup, Ghatkopar, Mankhurd, Shivaji Nagar), where she has done, she says, about 20 years of work on behalf of the area's less privileged people. 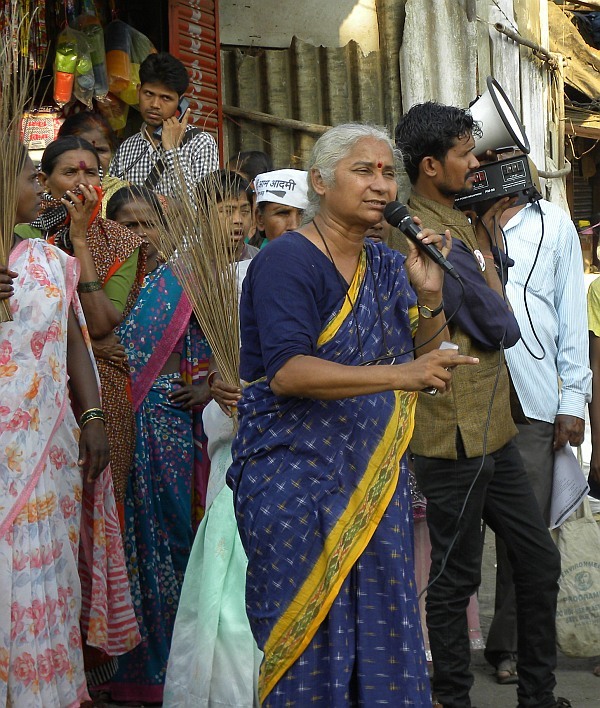 It is a mixed constituency of middle-class residents and slum dwellers, but the jhopadpatti people have the upper hand, at approximately 60 percent and it is one of Mumbai's poorer constituencies, according to her volunteer team. It has 725,273 women voters, as per the Election Commission. There is a sizeable Dalit population and is about one-third h Indians. Vikhroli's Park Site Colony is the poorest area in this constituency and it is where Patkar began her social work in 1979 educating slum children under the Community Aid and Sponsorship Programme India. Social work was something Patkar grew up with -- her father was the convener of the Chemical Mazdoor Sabha. Her mother Indutai Khanolkar, a former senior postal service employee, at the grand age of 83 still works, educating children free. Say long-term colleagues Vijaya Chauhan and Anil Hebbar "People associate Medha with being anti-development, but she has worked mainly for development, education and not just in the Narmada Valley." In the 2009 election Nationalist Congress Party candidate Sanjay Dina Patil scraped through with 2,933 votes against the Bharatiya Janata Party's Kirit Somaiya. Both men are in the fray this time as well. But 900,000 voters apparently did not vote -- 500,000 of them women -- in this constituency of about 1.7 millions. There is hope, among her volunteers, that apart from taking a lion's share of the slum vote, Patkar can pull in new voters, especially women and some disaffected past Maharashtra Navnirman Sena and Shiv Sena voters, preventing Somaiya from enlarging his pie and shrinking Patil's. Kumar Ketkar, chief editor, Dainik Divya Marathi newspaper and a distinguished observer of Maharashtra politics for 40 years, feels it is a very narrow, tough three-cornered fight that might follow class lines. "Somiaya should romp home, going by conventional political logic, but this is the first election that I am seeing that does not follow any political logic," says Ketkar. He carefully explains that the "but" is extremely crucial in this race, with the entry of Patkar and the fact that she can "destabilise" Somaiya. The slum vote, according to Ketkar, is closer to 50 percent, but maybe higher, he concedes. And there is a good chance that Patkar could pick up large blocks of anti-BJP and anti-Congress-NCP votes from the middle and lower middle class (the traditional NCP base) in addition to the slum vote. "If I had to bet," says Ketkar, "I would say Somaiya has maximum chances to win, but I would not rule out Patil or Medha because of an extremely tight contest." 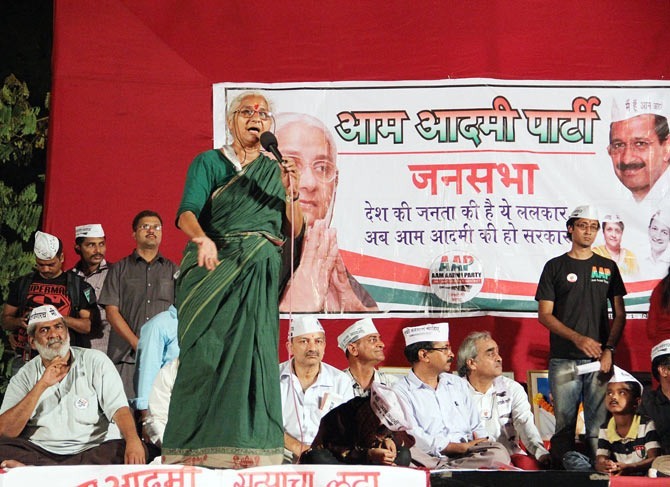 Image: Medha Patkar addresses a rally in Kanamwar Nagar in suburban Vikhroli. 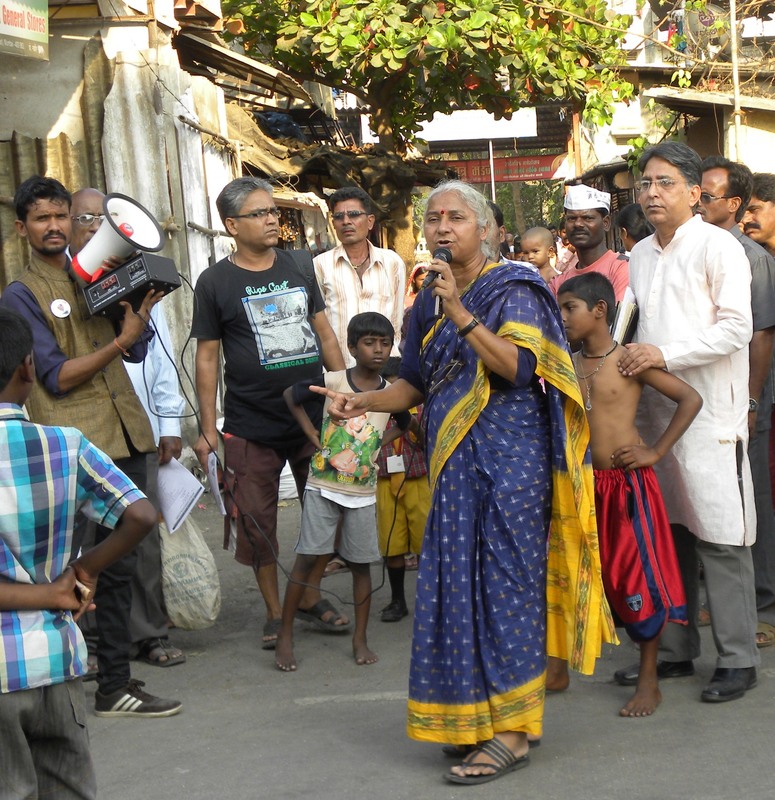 On a padyatra, that winds its way tirelessly to every nook and cranny of the lower-class but less poor neighbourhoods of Vikhroli -- Ashok Nagar, Hariyali Nagar, Tagore Nagar -- Medha Patkar, on foot, stops by at as many homes and small shops she can, meeting everyone. "Niklo bahar dukano se. Rang lado bemano se. Niklo bahar makano se. Rang lado bemano se (Come out of your shops. Come out of your homes. And fight the villains," says her spokesman, "Medhatai has come to see you." In her speeches, she says, "Rajneeti garibo ke paksh mein nahin hai. Tamam batein badalni hai. Yeh rajneeti badalni hai (Politics is not on the side of the poor. There is a lot we need to change. We have to change politics itself) We need change. Jaise Dilli mein hua. Maharashtra mein naya desh laana hai (The way we brought about change in Delhi, we need to bring change in Maharashtra as well)." Patkar's padyatra is a tiny operation. Two mikes and a speaker, that travels on someone's head and a few folk trailing her with AAP topis and the ever-present waving of AAP brooms. She stops very five minutes to address the neighbourhood with a fiery speech that focuses mainly on brashtachar (corruption) with a capital B, alternately moving between Hindi and Marathi. Brashtachar is a big crowd puller. Karodon ka brashtachar. Anyay. Atyachar. Gotala... Words that have powerful resonance. The speech often fastens on the Adarsh-Lavasa-Hiranandani-Adani-Ambani hot themes. Patkar and her team have filed a series of cases to bring attention and resolve each of these land acquisition concerns, be they Lavasa (interior Maharashtra) or Golibar (near Santa Cruz, northwest Mumbai), where 200 people were evicted from their homes in 2013. "The poor find it difficult to get homes. But for the rich, homes that were meant for the poor, are available for a song. Mumbai 40,000 crore tax deti hai. Is shahar ki garib janata 72 per cent slums yani jhopad patti mein rahte hai (Mumbai gives the exchequer Rs 40,000 crores/Rs 400 billion, but 72% of this city lives in slums)," she says. Often people take our their cell phones and record her speech. Santosh Lokhande stands on the side of the road, filming her. Why did he record her speech? He explains, as if it should be quite obvious to you, "She is Medha Patkar. Of course, I will give my vote to her and Kejriwal." Patkar has an affectionate presence. There is no distance between her and the person on the road. She is quite easily one of them and does not have to project herself to appear that way or close the gap. She is everyone's mother, sister, daughter, friend. And she knows their struggles. 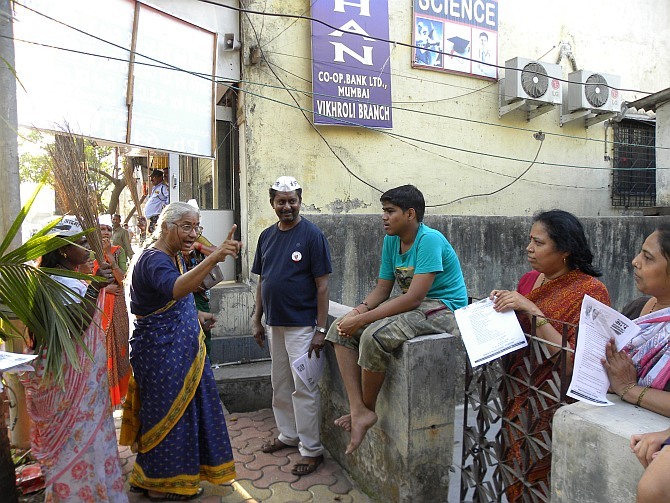 Image: Medha Patkar campaigns door to door in Vikhroli. 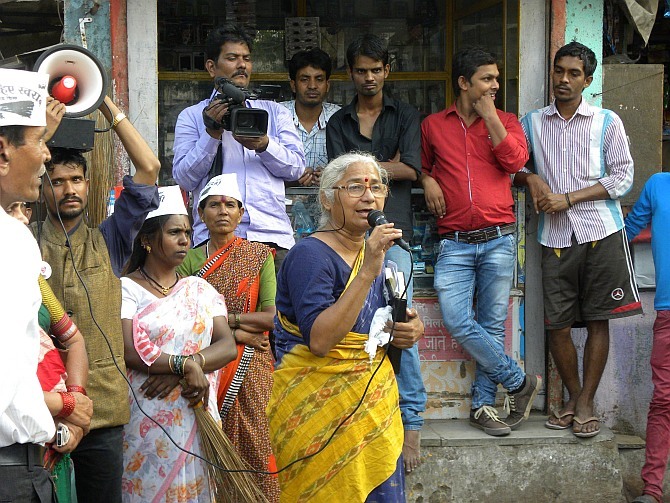 Medha Patkar believes in the significance of the aam aadmi term in reaching out to the mainstream. "Aam aadmi means what? 96 per cent of the population in this country, the middle class, the upper middle class... Only a handful are in the big loot. Leave them out." "The rest of the people will all be unequivocally committed to a corruption-free country, a communalism-free country, a casteism-free country." Pande, who is from Uttar Pradesh and works as a security guard, says, "Everywhere there is brashtachar. Worse than cancer is brashtachar. You can take medicines and survive cancer, but you cannot fight brashtachar. Nobody is answerable. When elections come they talk the sweetest chakachak stuff. No, no one else has come here to see us." An unusual feature of her padyatra is the large tin donation box that is part of Patkar's entourage. A volunteer goes from shop to cart to shop asking for whatever they can give. Ram Lal, who gives a small donation, is a fruit seller. He says he admires her. Zeenat, who is buying fruit, says she is not sure if she will vote for her. Mangal Vowalkar is a staunch Medha supporter. So is Kishori Lala: "Ise jyada kya tussali chahiye candidate mein? (What better satisfaction can you ask for in a candidate)," he asks. Kiran Bhanushali, a shopkeeper, would not give a donation. "I support the BJP," he says. Gujaratis will support Modi around here, other residents explain. Women react particularly well to her. "She is a woman fighting. We need to support her because she is a woman too and she will strengthen women," say Hema and Sunita Bhalerao, homemakers and Shobha Suryavanshi, a shopkeeper. Should the people in these areas, and the bordering ones, that she has been tramping through, for more than a fortnight now give her enough votes to take her to Parliament, what will be her single most important task? Curtailing corruption is critical for her. She feels it could happen with the creation of an atmosphere where citizens feel they have the strength to not tolerate it and can be vocal about protesting against it and there is a framework to voice this. Patkar carefully vocalises though her most important wish. "There should be studious kinds of debates on the issues -- political, economic and social -- that should get primacy and regain due space." "We have a tradition of respecting the minority. Minority not only in religious terms, but the minority in terms of opinions and on the basis of the Constitutional framework and values like equity, justice etc and directive principles... The MPs must really represent the people and not represent themselves for the allowances and benefits which they have been doing more often than not." 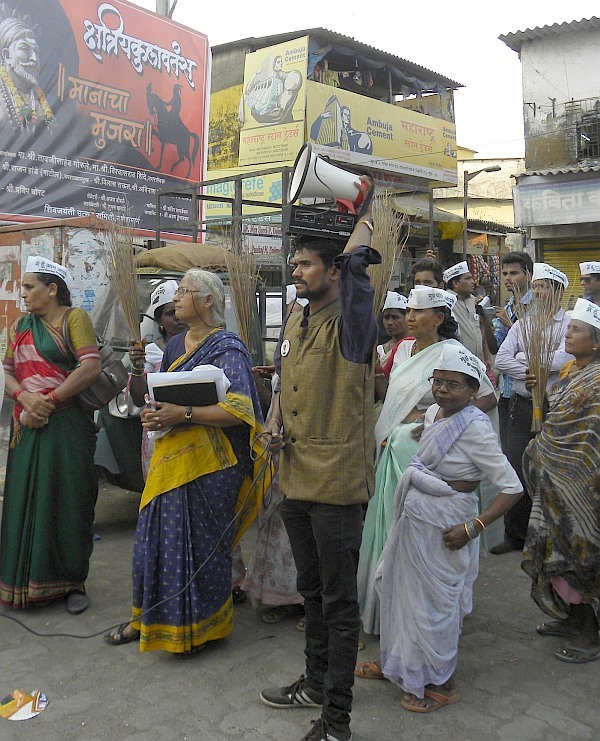 Image: Medha Patkar on the campaign trail. "Other countries like the US have mass or grassroots democracy. India is the largest democracy in the world. But unfortunately that is absolutely lacking. The people in the ward of a city like Mumbai -- not like the Adivasi areas in the Narmada valley where there was 1 percent literacy -- everyone is almost literate except some slum dwellers, yet they do not gather together to think about anything. Once in a way a gathering at the Gateway of India when the terrorists attacked." "But (this kind of politics) are a day in and day out attack on their privilege, on their rights, on their land, on their resources, livelihoods and democratic tradition and even the homes of a large percentage of Mumbai's population. But no one responds. No one reacts." Even if Kejriwal's anti-corruption crusade provided the impetus for her to join politics, why join forces with him? Does his knee-jerk brand of politics agree with her? Perhaps the values the AAP represents, especially after the Somnath Bharti incident, are too narrow for the people Patkar represents? This is a question that Patkar is probably asked over and over again. Her volunteers say voters always question them as to why they are with the AAP after the debacle in Delhi when Kejriwal "ran" away from the chief minister's gaddi. Patkar concedes that mistakes were committed and it was clear that that in the Somnath Bharti incident women were not "properly respected" and that things should have been done in a very different and dignified way and the "minister failed, not once but twice." The party, Patkar says, and she told them, needs to think of the aam aurat (ordinary women) too. But she does not believe that the AAP as a whole is either anti-women or out to denude women of their dignity or rights. She does not find Kejriwal inconsistent in his political philosophy and feels politics is often about rapid fire decisions, compromises, being open to change. "One cannot be too dogmatic," she says. His transparency and accountability are the most attractive factors for her. Patkar explains that she felt she needed to belong to a political party and AAP was the most suitable, one that came along at the right time..
"I wanted to support the party and go for the campaign in a big way, not contest myself," she says. "There is also a need to be with this party, which is a party in the making. A manifesto in the making. A party in the process of setting a new tone and model. In spite of some failures, there is a scope for an evolution of ideology. And that must be carefully chalked out. (They seem to be) our kind of people."